Every one-year-old needs a picture of them in a high chair making a total mess of their cake. Mathias did not want to give up his carrot at first for this triangular stripey food his mommy had baked but with enough coaxing (here, she said, taste this) decided to humor her. Plus a random airport picture, just because I’d never seen a plane with a bumper sticker before. If you put a handknit hat on Mathias’s head he will grab it, pull it hard sideways, and fling it with great force when it finally gives up and comes off. If you put it not quite on but flat on top of his head and convince him it’s a new version of peekaboo, trying to get him to accept the idea of wearing something up there for even a moment (kid. You live in Alaska) he will giggle like crazy and only take it off and hold it in his lap waiting with a big grin for another round of the game. Mathias picked up a Sandra Boynton board book and toddled awkwardly towards their big dog and plunked down with a thunk. “She can’t read it to you,” his mommy laughed. Babies live life on speed dial: somehow Mathias turned one today. I was looking at suitcases at Costco online, looking for a lightweight one, and it hit me–don’t take it for granted: I looked at the dimensions. Height plus weight plus depth, add up those inches. If the number’s over 60, Alaska and apparently other airlines charge you an extra $75 each way. Which adds up fast to the new suitcase you’ll want after buying some of those. Our old ones were fabric and they’d gotten to where they made our clean clothes arrive smelling like they were on the return trip. I think it was a scrub jay. Nailed his but good. Yeah, it scrubbed clean, but he’ll never look at it quite the same way again. Someone’s birthday bash was a ton of fun. One friend happened to mention to me that her youngest had lost his finger puppet. Which kind of threw me: he’s six, and it’s been long enough since I gave him one that I didn’t even know he was old enough then to remember it, much less to treasure it all this time. Wow. Very cool. Wanting to replace it to take some of the sting out of the loss, I asked her, What character was it? So with that I dug into my purse and, nudging the ziplocked knitting aside, started pulling a big bunch of them out. I had actually just restocked in there and they take so little room, and as puppet after puppet after puppet emerged she laughed in surprise. They made a colorful heap on the table. She went home with her favorite two, and Richard’s friend from work whose wife couldn’t make it at the last minute was so charmed with the first one he picked out that we all told him he had to chose one for his wife, too; he went for a second handknit rubber ducky to match the first and tucked them away safely in his pocket, clearly looking forward to the moment. The waiter at the restaurant watching all this then got surprised with a colorful parrot as we stood up to leave. The fact that he loved it made the night just that much better. I couldn’t possibly knit fast enough to make something for every person who came to celebrate, but the good women of Peru could. From this three years ago, a new whip trying to leaf out again after being stripped bare every night for two months by Japanese beetles, to now. 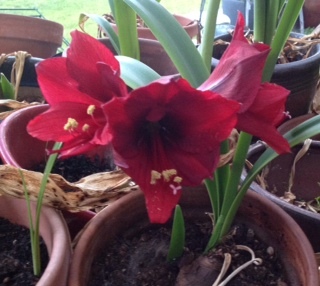 It survived when I thought it might not and this year it is finally really showing us what it’s meant to be. 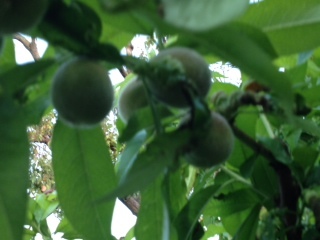 And just wait till those cherries start appearing! Rereading that old post, though, I’m quite amazed that that tree is on a standard rootstock–I thought it was an ultradwarf like the sweet cherry. I mean, it certainly grows like one! Slowly. Huh. 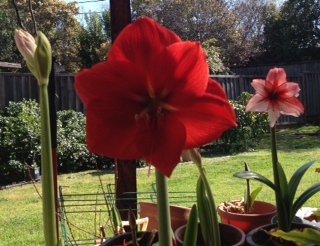 While the other one, which is a little older (but has to reach a little more for its sun), is at seven feet. Go figure. The honeybees were happily and peaceably buzzing in the flowers. There’s at least one on the left in the close-up, down in the petals. The story of the cowl. 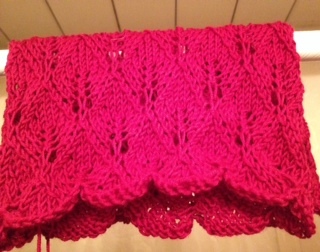 I bought the yarn with a particular person in mind, knowing her favorite color, but as soon as I got going with it I knew the shade was off and it just wasn’t going to be it. And yet that yarn had practically thrown itself at me in the store just the same. What was I thinking? Nothing for it but to keep on knitting till it’s done–there’s always a place for one of these, and if I hurry I can get it off the needles faster and get on to what I’d hoped for. Done and blocked, it quietly made a case for itself: it was pretty. I’d almost missed that. So this morning as I ran the ends in I found myself saying a little prayer: please, could You make it obvious whom to give this to? Like, really obvious so I don’t second-guess myself and wonder? Not that I’m in any way owed that, but I’d love to have the gratification of knowing it was worth it given that I kind of struggled not to be annoyed at it for making me wait for what I’d wanted to do. Sitting in Sunday School, I spotted two new people across the room, one of whom had a face that was familiar to me from other contexts but I don’t know her; she was wearing a dress that matched that cowl. There was this little spark of happiness that exclaimed, Yes! But she was deep in conversation with the other woman and in no way was I going to give offense by excluding her, so my attention moved on. Sunday School ended, the Relief Society women’s meeting was about to begin–and that acquaintance stood, walked across the room, and sat down by me to talk to the next woman over for a minute. She loved it. She was thrilled. Yes, and it matched her dress! She proceeded to tell me about things she’d done with my daughter, reminiscing fondly over her baking skills, telling me how much she and her friends had missed her and how they hoped she would move back. Who doesn’t need to hear something like that about themselves? (I passed the good word on to her.) What mother doesn’t love hearing how much her child is loved? Who knew how much that simple bit of knitting would come back to bless–us, too? I really like Michelle’s friend. And she’s a knitter. What a way to start off knowing somebody! Plums and peaches. It still amazes me, this whole concept of putting a dead-looking stick in the ground in the winter and a few years later having a nice-looking tree offering the best-tasting fruit. 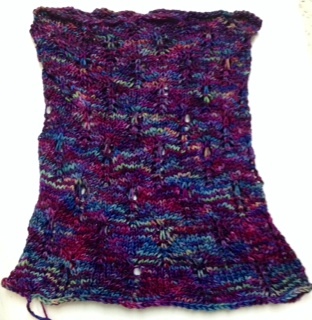 Newly finished: a cowl in garnet Dona superwash extrafine merino that I expect will find its way home tomorrow. 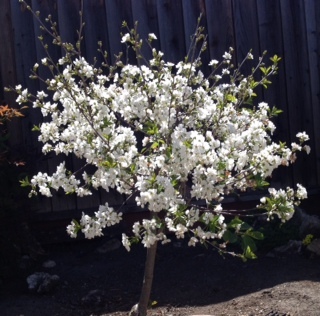 What I once did not know is, each little diamond contains the growth pattern of a pear tree. Done and drying: I do like that Anniversario colorway. 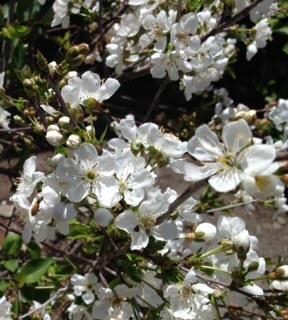 As the English Morello tree holds up a sign to the honeybee highway: Will Bloom For Cherries. This is the time of year when the weeds go to seed here. They come up in January before the grass (which still tries) and choke it out, then dry up when the rains stop. Except, the rains haven’t stopped, so they are really going to town. Pretty little purple flowers were starting to carpet half the back yard. Charming–if you don’t know. A friend responded to a tree company’s offer of “free mulch!” and found himself with an entire truckload dumped on his driveway. After several weeks of hard labor trying to get it to his back yard and spread around with his little kids sort-of-helping, he finally cried uncle and begged the teenagers at church to rescue him. They came, and some of their parents, and got it done. There’s no way I was going to do that to them or me. In a moment of desperate inspiration, then, the light bulb went off. I have all those frost covers. I spread them out across almost the entire infested area. I came close. I held the edges down with anything I could find. I should have done this way sooner but I thought of it when I thought of it. Well, that’ll look pretty to all those airplanes flying up there. I kept them in place for a week. 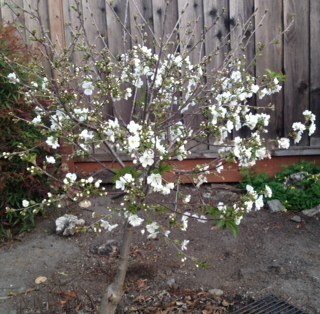 Sorry, bees, but hey, the cherry and lemon trees are blooming. My lawn mowing guy was coming today so I gathered the covers up last night, curious to see the result. You could tell exactly where they’d been: there were short weeds and there were tall weeds, in squares. They’d suddenly put all their energy into trying to outgrow this barrier to their sun and energy. The covers didn’t black it out–they were designed not to–but laid out flat rather than tucked around, there was a double layer everywhere. I saw just a few clusters of stiletto-sharps. I was very pleased with myself. It made it worth putting up with a frankly ugly view out there during the experiment. And then tonight I went to go put a frost cover on the mango. What stabby seeds there were had been velcroed onto the covers. Well, that works, too, I guess. And the disclosure in court over Trump’s lawyer’s lawyer’s objections that Trump’s lawyer of late had but three clients: Trump, Trump’s fellow rich friend who likewise had a woman he allegedly wanted paid off and silenced, and (drumroll) Sean Hannity of Fox News. Meaning any time Hannity has gone off on Mueller’s investigation it could well because of what Mueller might find in the files now seized from Cohen on Hannity. I bet he’s finding the ground a bit shaky over there. I laughed. I told Jean, You wore that quiet green last week, and so (I held up the sage-green cowl) but it doesn’t go with that sweater at all! Then to her delight I offered her not just the green but (reaching into the bag again) the purple and the purpley-brown to choose from. Then she explained the sweater: her husband had bought it for her years ago; she had felt him close to her all week, and so she’d wanted to bring it to church today. Mona Jo, sitting next to her, when offered a To Be Continued if she preferred something else, happily chose the brown-almost-purple knit from Woolfolk, also extraordinarily soft. A little later, Gail, a knitter in her younger days, was wearing a skirt in a sage green plaid. That sage green cowl went exactly with her strawberry blonde hair, too. Wool and mink? Mink?! She laughed and held it to her as if to say, Ta Daah! I got mink! It went right on and it stayed on. It wasn’t very big because I didn’t have very much of that mink left, but she told me how warm that bit around her neck would keep her on our cold mornings. And so these three widows, lifelong friends who had raised their children here (some of whom are now grandparents themselves) all came away on the same day with a handknit cowl in a color they liked. I thought I was just planning for Jean and letting the rest play out as it might and it all came out absolutely perfect.